Carmine Jennings focuses on her fitness. With members ranging from 60-something to nearing the century mark, the Silver Sneakers exercise class at the Cannon County Senior Center works out five times a week. "I was really weak," says Doris Markum, 72. "I came to improve my strength." Markum was recovering from eye surgery when she started the classes. Now, about a year later, she walks a mile and works out with the class three days a week. "I'd encourage anyone to join us-it's good for you," she says. Carmine Jennings, 86, says she attends Silver Sneakers "to keep me young and active." And if her smile is any indication, the class is working. "Silver Sneakers is for mature people who may have health issues like arthritis," she explains. She's been attending for a couple of years and adds the class "is helping." 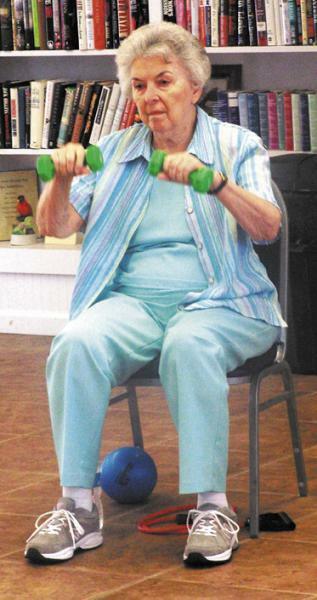 Jean Bensmiller, 78, started coming to the class because she thought she needed more exercise. After she'd been attending for about two years, her doctor told her she needed open-heart surgery. She says the classes helped her to recover completely from the surgery. 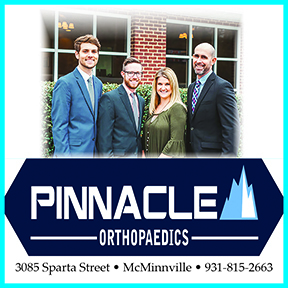 "At my age I was pretty old for the surgery, but the doctor said I was a good candidate because I'd had this class," Bensmiller says. What's more, after the surgery, skills she learned in the Silver Sneakers class helped her do the rehab program. "I found out that because of this, I could do what they asked me to," she adds. "Rehab was the same exercises we do." Bensmiller's husband Arthur, 79, comes to the classes with his wife. "It helps me get out of bed in the morning," he says. "And everyone is friendly, too." Friendships and socializing are major reasons why Lila Jordan, 80, comes to the senior center and the exercise is a bonus, she says. "I didn't have anything to do," she says with a smile. "I come here to be with people. You can't watch television or read all the time. Augusta Donnell, 86, says she started coming to the Woodbury classes as soon as she heard about them. "I was going to Murfreesboro to exercise," she explains. "When they started here, it saved me the trip." She says she tries to attend at least four times a week: "Whole body exercise is a good thing. It keeps me up, active and going." Juanita Burks, 89, also attends the program because it's convenient. Like Donnell, she also went to Murfreesboro until the program started in Woodbury. "I'm having fun and exercising for health," she says. The classes meet twice each day for one hour, with one day a week devoted to yoga and stretching exercises. The first class starts at 8:30 a.m. and the second starts at 9:30 a.m. Anyone 60 years or older is welcome to join. If they want to get healthy and have fun at the same time, that is.